That your AFR readings should match your Fuel Map, then get Fuel Trims as close as possible. 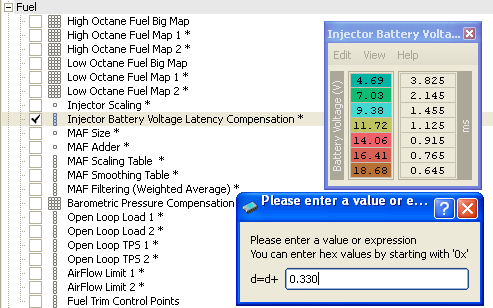 That Fuel Trims should be perfect, and that AFR readings are going to be offset from the Fuel Map and not match up. 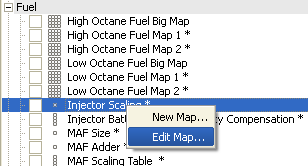 I’m of the first school of though, our Fuel Maps have a nice AFR scaling so why not use it to make tuning easier. If things are not perfect at idle the Front O2 Sensor will take over and fix it, that is why its there. Because the fuel pump flow isn’t linear(flow rate changes with fuel pressure) and your fuel system may have restrictions at high flow rates, you are not going to get AFR to match perfectly in every cell. But you can get close, so its within a 1/10 point or so. The first step is find your Base Settings. The best way is to find someone with the same injectors and copy their settings. I have some example settings at the bottom of the page. Injector Scaling is the flow rate of the injector. To change, press = , then enter the new value. The Evos guys use a different Scaling then I use for the DSMs. For example an EVO site will give the flow of stock 450s as 424, but DSM sites say 450. Another example is they give the Evo8 560cc flow as 513, but you would use 560 with a DSM. If you wish to use a value you get from a Evo site you need change the scaling. First Right Click and select Edit Map. 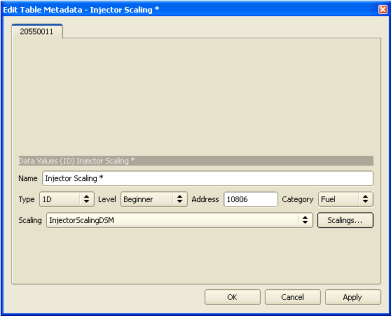 Then click InjectorScalingDSM and change it to InjectorScalingEvo. Injector Latency or DeadTime, is the amount of time it takes for an injector to open after voltage has been applied to it. The reason for the 2D table with different voltages, is it takes longer for the injector to open at lower voltages. To change a value in the Latency table, select a value then press = , and enter the new value. Often only one value is given for Latency, not the whole table. For example .330, this value must be added to every item in the table. Then Edit -> Add to Data, and enter 0.330, and hit Enter. Once you get your Base Settings fairly close, its time to get your WOT AFRs to match. AFR Map is the AFR the ecu is aiming for. You need to compare AFR Map to WideBand. If WideBand is richer, Injector Scaling should be increased. 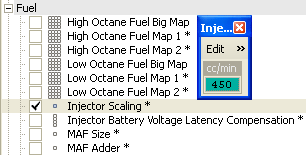 If WideBand is leaner, Injector Scaling should be decreased. The only areas of the log you should look at are when you are WOT, in Boost, and in Open Loop. Because there is a few feet distance between your injectors and WideBand sensor, your AFR Map and WideBand readings will not line up. The WideBand will lag behind a second or so. To remedy this you can make all your AFRs above 100 Load the same AFR. This way you do not need to try match cells with different AFRs and take into account the WideBand lagging behind. After you have WOT dialed in, its time to get your Fuel Trims correct. One Fuel Trim cycle takes about 4 minutes, and it takes about four cycles for the trims to max out. Take a look at your log, Oxygen Sensor voltage should be cycling from 0.1 to 0.9 volts every second or so. If it is stuck and not cycling your Base Settings are off and need to be adjusted. Take a look at your Fuel Trims, Fuel Trim Low is the only one that should be adjusting. If Fuel Trim Low is positive, Injector Latency needs to be increased. If Fuel Trim Low is negative, Injector Latency needs to be decreased. You should increase or decrease the whole Injector Latency table by the same amount. +/- 5% is considered close enough. 0% is a unattainable goal. +/- 12.5% is the Trims maximum, it won’t go any higher or lower. With Idle and WOT tuning done your injectors should be dialed in pretty good. But there may times during low load cruising and transition out of idle and into WOT that things may not be perfect. This is where the MAF Smoothing table comes into play. MAF Smoothing adds or subtracts extra fuel at different MAF Hz levels. If you ever used a SAFC, it functions very similarly. Get a log, while cruising, like a trip on the highway. You want to stay in Closed Loop, so light on the throttle and RPMs under 4000. Keep everything steady for about 16 minutes if you can. Now we will have a look at the different Fuel Trims. Open up Fuel Trim Control Points. This tells you at which MAF Hz, the Fuel Trims, Low, Mid, and High switch. Mid turns on when above 112 Hz, and Low turns on when below 100. We take the average of these two and get 106 Hz. Now we look at the next two points, Mitsubishi did something tricky here, they set them both to 1594 Hz. What this does is it never lets High turn on. Now we know, Mid = 106 to 1594 Hz, and High = Disabled. Now we can take a look at our log. Fuel Trim Low should be near zero, if not go back to Idle Tuning. Fuel Trim High will be zero, since it is disabled. Fuel Trim Mid is what we want to look at, if you kept your driving steady MAF Hz should stay in a small range. If Fuel Trim Mid is positive, MAF Smoothing needs to be increased. If Fuel Trim Mid is negative, MAF Smoothing needs to be decreased. Only change the area of the MAF Smoothing table that your MAF Hz are in. Then get more logs at different MAF Hz level, until you are satisfied everything is perfect. PTE 1000 ---------------- 940 ------------------  ?? ?